This is the second installment of the Visiting Artist column. 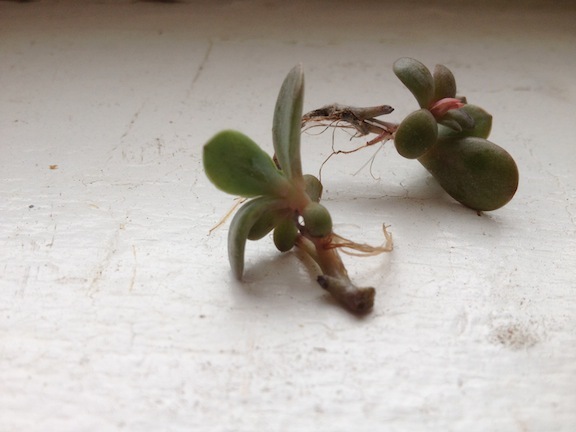 Here, Heidi Norton reflects on the use of houseplants in life and in art. Norton’s south-facing sun room in her Humboldt Park residence. At one point long ago there was no such thing as inside and outside. And then there was, and what we call nature was outside: plants and rocks and dirt, bees and rivers and etcetera. And we figured out how to bring it all home and name it and corral it into gardens. A chaotic world parceled and reconfigured and newly ordered. The dizzy continuity of everything outside cut apart so beautifully into pieces. So we turn our living rooms into almost-landscapes: so-called houseplants are born; born, it seems, to live in pots, on shelves, on tables, a living thing is now a discrete object; lovely. Frank Lloyd Wright’s Fallingwater, in rural Pennsylvania, is a masterpiece—one of those must-sees of your lifetime. The home is the ultimate example of integrating nature and domestic space. At Fallingwater you can feel the purity of the air on your skin, in your lungs, with your eyes. After visiting, in 2011, I became infatuated with ways of cleaning the air around me. I knew plants released oxygen, but not to what extent. In the 1980s, the NASA Clean Air Study found that oxygen-producing plants could be used to remove toxic chemicals from the air. The plants break the chemicals down into harmless organic byproducts in their soil, which they then use as food. Dr. Bill Wolverton’s “How to Grow Fresh Air” is great to reference. Top three oxygen-producing plants: Sprouts, Snake Plant and Areca Palm. Top three air-cleaning plants: Red Edged Dracaena, Warneck Dracaena and Peace Lily. 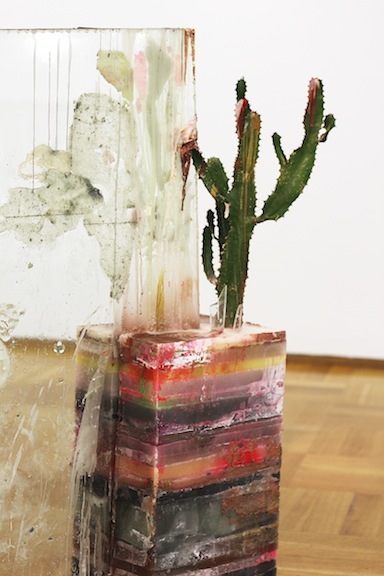 Heidi Norton, “Meditations on Moldavite Besednice (A Symbiosos),” glass, wax, cactus, resin, and mirror. When one buys a houseplant they consider things like light, maintenance, growing patterns. Sometimes we even consider its form and shape—are the leaves flat with many repeating shapes like a fern or are they thick and asymmetrical like a succulent? Most plants need soil to survive, but that soil can be held by a variety of things. I have used teacups, baskets, buckets and more. In 2011, I began making art that used layered colored wax as the base for soil and plant. I found that cacti and their short root systems thrive in these spaces. “Onions Wrapped up and tied around the neck, chest goose greased with rawhide around neck, peach leaf around it and cold well water, spider web and bacon wrapped in muslin.” This was handwritten on a little piece of sepia paper, roughly folded and tucked into “The Foxfire Book,” published in 1972. I had requested my parents send me a collection of their books from the 1960s, seventies and early eighties, manuals they had used to help craft and master their “homesteading” skills, research for my solo exhibition, “Not to See the Sun,” last April. Finding this note brought me a great amount of shock, as it was written in my father’s distinctive handwriting. As my parents have gotten older and farther away from their previous ideals, their ability to believe that they were homesteaders, hippies and non-grid dwellers is just about non-existent. Even after showing the note to my father, he still doesn’t believe that he wrote it. This idea of rewriting the past through time and memory modification—creating your own mythologies—is for another topic. It saddened me that my father wants to disconnect with his past, as I believe much of my work as an artist exists based on my exposure to these ideals of self-sustainability—living of the earth and the co-existence between man and nature, a symbiosis of sorts. We are twenty days away from autumn equinox. I am closely observing the trees of Humboldt Park. The big maples always lose their leaves first. The leaves are no longer the lush saturated green hue, but rather a bit faded and flat of color. An equinox occurs twice a year (around March 20 and September 22), when the tilt of the Earth’s axis is inclined neither away from nor toward the sun, the center of the sun being in the same plane as the Earth’s equator. Do farmers still plant by the signs? According to Foxfire, planting is best done in the fruitful signs of Scorpio, Pisces, Taurus or Cancer (when the signs are in the lion’s, feet, neck or breast). Plow, till and cultivate in Aries. Never plant anything in one of the barren (Head) signs. Always set plants out in a water or earth sign, never graft or plant on Sunday as this is a barren, hot day (the sun’s day). Plant flowers in Libra, which is an airy sign that also represents beauty. echeveria clipping for a gift. 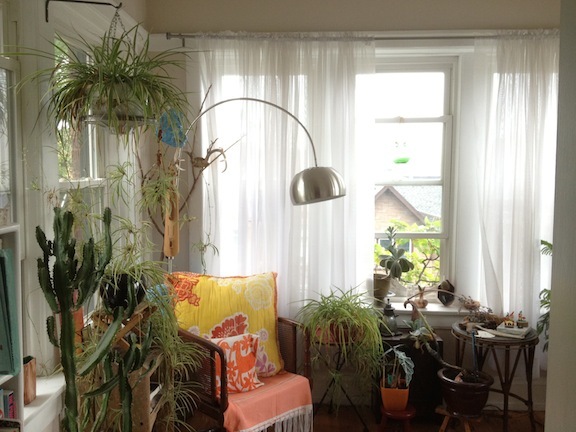 East-facing windows receive cool morning sun, and are good choices for most houseplants. However, in the winter, east windows receive more sunlight than during the rest of the year. North windows are great choices for houseplants that thrive on indirect light. Cyclamen would love this window, as would the peace lily, Chinese evergreen or pothos ivy. South-facing windows receive a lot of sunlight in the winter, but less in the summer. West-facing windows receive the most sunlight of all. In fact, plants on the west side of your home may need to be protected from the sun. Plants make the best gifts. I was given a succulent four years ago from a close friend. This original plant no longer exists but instead it has given life to over thirty offspring, which I have gifted to others (including the person who originally gave me the plant). Stem cuttings, or strikings, are easy to produce. Take stem cuttings in the morning. Using a sharp knife, cut off growth tips just above the node, or the point where a leaf or side shoot attaches to the main stem. Each of the cuttings should be between three to six inches in length and have four to six nodes. The stem tissue should be easy to cut through. Place in water to produce root then pot in soil that plant will thrive in. Heidi Norton’s solo exhibition runs through October 23 at the Museum of Contemporary Art, 220 East Chicago. The first paragraph of this essay was collaboratively written with Karsten Lund, curator of Norton’s exhibition.